The object of this imitation is the magic wand held in the hands of the old-fashioned, decent wizard. In form, the wand is about 1m long, 30cm thick, dark black, cylindrical with golden metal tips at the end. The wand has a round metal ring at the end, followed by a large red gem set with four metal claws. Before making, first do a whole plan: Gem: look for the right size crystal glass or acrylic gem model metal ring and inlay claws on Taobao: plastic steel reinforced soil wrapped plastic base, the outer layer polished spray gold black color canes body: look for a length of broom, cut the length needed, wrapped tape spray metal tip: directly on the aluminum cone round the earth patching, of course, when you need to be able to flash. To get closer to the imitation target, remove the guard and install it upside down. First remove the stone from the ring and estimate the size of the stone and the required staff fittings. To prevent damage to the polished surface of the stone (crystal glass hardness is not high), protective tape is applied to the face that needs to be protected. Although it is possible to carve out the entire bracket portion of a gem from a plastic material, this is too expensive considering the high price of toppings and the fact that toppings tend to deform when solidified. So you need to find something of a certain strength to use as a substrate. Find a Coke bottle of this size and cut off the shrink portion of the opening portion of the bottle, just the right size. The steel is then mixed to fill the soil, evenly blended and pressed into a thin, uniform sheet with a club, wrapped around the exposed portion of the base of the flask. The clay itself is sticky enough to hold the top of the bottle and the crystal gems together without the need for additional glue. Place it upright and then, after a few hours, trim the patches, which are not fully solidified, with an art knife. After finishing, wait for the toppings to harden thoroughly and then use sandpaper to smooth the toppings. The toppings give a feel close to softer stones. After tearing off the protective film, it looks like this. Mix a certain amount of earth according to the previous example, after rubbing the growth of the strip squashed, glued to the base as a decorative metal ring. The same in a slightly dry shape with a knife, after drying with fine sandpaper polished smooth. An ordinary stick is enough. A coke bottle cap is nailed to the head of the stick. 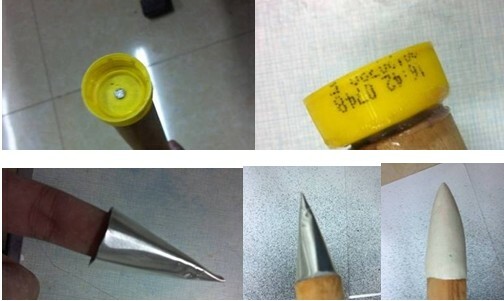 The glue is strong, the stress is concentrated in this place, and the head of the stick is not loosened, depending on the glue. A small conical skeleton of the end of the stick is rolled with aluminum. Try to make it round, though it doesn't matter. After that, another layer of earth is added. This accessory is made between the stitches in the painting process to save a little time. First, rub the growth stick with soil, then flatten it into a flat strip to shape the general shape of the claw on the head of the stick. Cut off the excess part of the tip with an art knife. The initially shaped gripper needs to be removed for drying, trimmed, and finally sprayed with gold paint and glued back on the head. Then is sprays the paint, after sprays with 502 to stick head, uses 502 time will leave some white trace, after repairs time again to fill the color. Put on the head of the staff to see the effect. If it is found that the head of the stick is crooked at this time, it is time to remedy it quickly. Wrap the masking tape around and start spraying the first layer of black primer. Rewrap the tape and spray the fluorescent red hue. The actual result is a deep red similar to the color of the gemstone. Flatten the stick with a layer of blue tape and create a pattern. The end of the stick is also sprayed with gold paint. Finally, the stick is sprayed with black paint, waiting to be completely dry before applying a layer of varnish. When applying black paint, be careful to protect the tip of the end of the stick that has been sprayed with gold paint. This step is simple enough to install a bright enough luminous LED good. Find a button battery holder, welded red LED. Because the battery resistance is relatively large, the current limiting resistance is also saved. 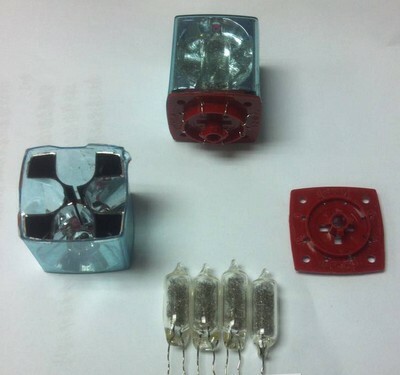 Install a 3V button lithium battery it can be luminous, brightness is also ideal. Stuffed into the head of the rod, just stuck in the cola bottle thread area. The effect is slightly dark spots. If going back to ancient times, I recommend the use of this Polaroid quadruple flash bubble (Magic cube), choose red (electric trigger), and then can be removed from four small flash bubble, each small bulb as long as connected to a power of more than 3V can flash, circuit and light-emitting diode as simple, and do not consider the positive and negative pole, with a 14500 iron phosphate battery is very suitable. Buy a disposable camera Disassemble the electronic flash module and put it in. Kodak's seems to be only 12 pieces each. All the parts of the staff in the previous steps have been made. The next things include: seam repair and polishing, as well as hand painting in small pens where painting is not possible. These are bits and pieces of work that require patience and care. Don't be curious to pick it up at this time.Because the paint is wet and you rush to the next step and it will be reworked several times.